We are having such a wet January I am trying to cheer myself up by planning for Summer 2018, the pool and hopefully some better weather! Hot tub with a view. We will be opening our heated outdoor pool in a couple of months ready for the Easter holidays. The family cottages are booking up quickly for the summer holidays! Check availability at the end of this post. Our pool looking inviting over Easter – wish the weather was always this predictable! The pool is always popular with children and if it is sunny there is plenty of space to sit in the sun and relax. If not, well the hot tub is just next to the pool. There are lots of beaches to explore within a 10-20 minute drive. Widemouth and Black Rock beaches are a long stretch of sand about 10 minutes away. These beaches are very popular with surfers. 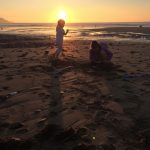 In Bude, Summerleaze with the sea pool is great for families. 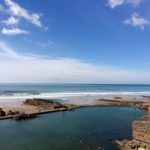 The beautiful Bude Sea Pool at Summerleaze beach. Crooklets is a bit quieter and good for rock pooling. 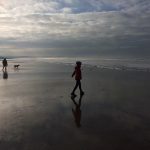 Further afield, Northcott Mouth and Sandymouth are both beautiful beaches to the north of Bude (about 15 – 20 minutes’ drive), with a mix of sand and rock pools as the tide goes out. If you would like something off the beaten track try Bossiney Haven at low tide. This is near Tintagel, about a 20 minute drive and a 15 minute walk down a steep rocky path. Or walk north from Crooklets in Bude at low tide towards Northcott Mouth, a long stretch of sandy beach. Just keep an eye on the tide! The beach stretching from Crooklets to Northcott. We still have lots of availability in early July. The week of 30 June is the last week left in our lovely Farmhouse (sleeps 11, £1840). We have availability in our cottages for two throughout July and August. The Times featured a walk along one of my favourite sections of the South West Coastal Path (The Times, 20/1/2018 by Christopher Somerville, or find the walk on Christopher Somerville’s website). This particular walk starts at Northcott Mouth, just north of Bude and follows the South West Coastal Path above Sandymouth to Duckpool. It then heads inland to Coombe Valley and back to Northcott Mouth though woods and the countryside. Northcott Mouth is a short drive from our cottages (about 15 minutes). The views of the coast are spectacular along here. 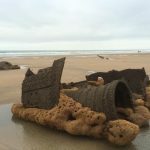 The wreck of the SS Belem can be seen just north of Northcott Mouth at low tide. In the Spring you get lots of flowers which are beautiful. Walking down to Northcott Mouth on a sunny day. Even on a grey and murky day in the Autumn it is still worth walking along here. The craggy cliffs, waterfalls, the long run of sand and sheer drops to the sea are always stunning. There are some steep climbs on this stretch of the path and a long flight of steps up from Northcott. 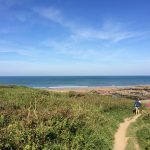 For an easier walk try walking from Crooklets in Bude to Northcott. This is an easier stretch of the South West Coastal Path. Time it right and walk one way along the South West Coastal Path and the other way along the beach, which is only possible at low tide. Check tide times online at Magic Seaweed. 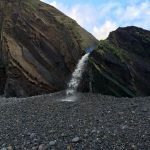 One of the waterfalls at Sandymouth. The Times recommended the Preston Gate pub in Poughill for lunch. Definitely worth a visit, or try Margaret’s Rustic Tea Garden at Northcott Mouth in the summer or one of the many cafes or pubs in nearby Bude. Margaret’s Rustic Tea Garden, Northcott Mouth. 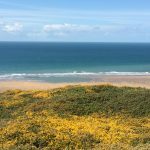 Are you looking for a short break over February half term 2018? We have availability in our family cottages sleeping from 4 to 7 starting any day from Monday 12 February (minimum booking 3 nights). 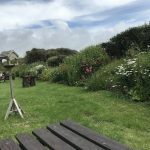 Our cottages are on a small peaceful rural site close to the North Cornwall coast. 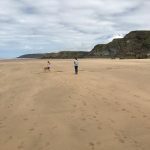 We are only 10 minutes drive from the coastal town of Bude and from Widemouth Bay, a popular surfing beach. 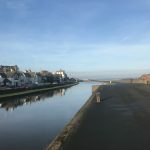 Walk on the canal path, explore the rock pools, take in the sea views from the South West Coastal path and enjoy a cream tea or a hot chocolate in one of Bude’s many small cafes before heading back to relax in the hot tub. We have a play area, games room, tennis court and hot tub on site. Bude canal, ending by Summerleaze beach. Walk along the tow path from Marhamchurch to Bude. 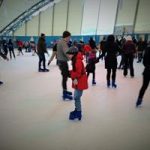 Further afield you can explore the Eden Project and maybe try skating on their winter ice-rink before warming up in the tropical biome. Or try the indoor and outdoor activities at the Milky Way Adventure Park.